Raising awareness of childhood cancer is often just as important as raising money for more vital research. It’s a world unknown to so many and yet devastating to the few who do experience it. Lots of amazing parents and their even more amazing children have been kind enough to share their experiences of childhood cancer with us, to help raise awareness of the need for more dedicated research. We affectionately call all those who share their story with us ‘a friend of Rosie’, the brave little girl who inspired us and our continued fight for children with cancer. “Oscar was born in June 2014. He was a much longed for baby, our very own miracle boy. Oscar was a normal healthy happy little toddler. So in June 2017, we were shocked beyond belief to receive the worst news any parent could ever be given. Our darling boy had cancer. Oscar was diagnosed with Rhabdomyosarcoma of the right temporal fossa. Our world was completely shattered. 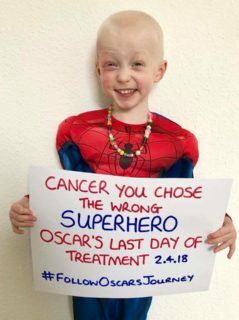 “Within days of diagnosis, Oscar had his central line fitted and was admitted to hospital to receive round one of 13 sessions of chemotherapy. On 17th November, it was decided that surgery to remove the mass was an option. 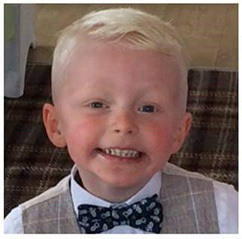 So on 28th November, Oscar’s mass was successfully removed, but due to inadequate healthy tissue margins, Oscar would still need proton therapy treatment to hopefully reduce the risk of relapse. “So in February 2018 we flew out to Germany to start proton therapy treatment. We lived in Germany for seven weeks while Oscar received 28 sessions of proton therapy, while under general anaesthetic, 5 days each week. 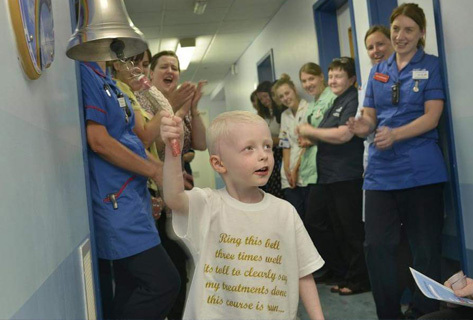 This was Oscar’s final course of treatment and on our return to the UK, he finally got to ring the End of Treatment bell.